"Consumers will be offered a variety of products in customized, brand-specific durable packaging that is delivered directly to customers, then collected, cleaned, refilled and redelivered," according to a press release. UPS delivers and picks up the Loop totes, and TerraCycle cleans them. The system will first undergo tests in Paris as well as New York, New Jersey and Pennsylvania, Lauren Taylor, global vice president of creative and communications at TerraCycle, told Supply Chain Dive via email. "Loop will launch in the U.K. later in 2019 with plans to be in Toronto, Tokyo and California in 2020," she said. With this rollout, UPS and TerraCycle are seeking to reduce single-use packaging and move forward the concept of a circular supply chain. UPS will play a critical role not only in delivering goods in Loop packaging, but also in handling returns of the packaging. "Returns are crucial to the circular economy," Patrick Browne, UPS Director of Global Sustainability, told Supply Chain Dive by email. "The circular economy cannot happen if there isn't an efficient logistics engine facilitating returns." The 3PL has grown accustomed to processing returns, given the high volumes generated by e-commerce orders. The true test of Loop's ability to create a circular supply chain will be in the packaging's durability as it moves through the last mile, then in reverse, then through the last mile again — and repeat. UPS and TerraCycle have tested Loop in the UPS Package Design and Test Lab. The lab's equipment "mimics the 'shake, rattle and roll' effect of high-speed conveyors found in transportation hubs and on commercial delivery vehicles," UPS said in its news release. The next phase of the pilot, testing Loop in the Paris and New York markets, "will offer great insight into how well the packaging works in real-world conditions," Browne said. If the Loop packaging stands up to "real world" testing, it could greatly enhance UPS' sustainability efforts, particularly in the last mile. UPS has acquired fleets that use alternative fuels and optimized routes to save on miles driven. The company makes public its goals and progress related to reducing its carbon footprint and utilizing renewable energy sources. The CDP, formerly known as the Carbon Disclosure Project, named UPS to its "A" List, which recognizes "businesses leading on environmental performance." The other test for Loop and its widespread adoption is the level of demand — from consumers and brands. Consumers — while often perceiving and claiming to care about sustainability — do not necessarily show that through their actions or understand the connection between their buying behaviors and the carbon footprint. This is especially true when the sustainable option is also the more expensive option. "Consumable products in the Loop platform will typically have comparable pricing to the same product found in a retail store," Taylor said. She said consumers would pay a small deposit on items delivered in Loop packaging, but that fee is refunded once the packaging is returned. 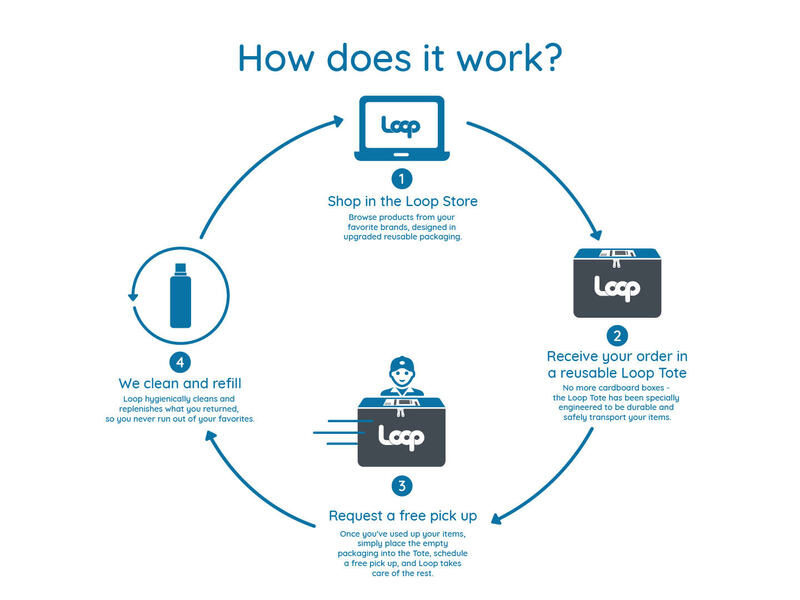 Loop packaging can be a financial benefit for manufacturers and retailers. "In the Loop model the package has shifted from a Cost of Goods Sold (COGS) to a brand-owned asset, which means that the brand no longer needs to mark up their wholesale cost to cover the cost of the disposable packaging," Taylor said.